Leading others requires you to influence them versus telling them what to do. Without the ability to effectively influence others, getting things done is virtually impossible. The PVI model – Perception, Visibility, and Influence – produces valued employees and in-demand leaders capable of driving decisions at every level of the organization. The two pillars that support inﬂuence are perception and visibility. Inﬂuence can’t happen unless you have improved others’ perception of you and increased your visibility. Once you’ve established the appropriate level of perception, you will have gained a solid reputation and foundation of respect. After you’ve increased your visibility, you’ll become known and valued in your company. Inﬂuence is now possible. In this course you’ll learn The PVI Model which produces the necessary influence qualities that all great leaders use. First, great leaders create an extremely positive perception of themselves throughout the organization. Second, they know how to increase their profile across the organization. Third, they know how to exert influence. 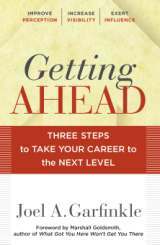 Getting Ahead: Three Steps to Take Your Career to the Next Level by Joel Garfinkle serves as the basis for this program. Through practical advice, true-to-life examples, and action-oriented tips, you’ll learn how to create and become an elite performer who influences outcomes, contributes to major decisions, and drives change for the betterment of the organization. When you become equipped with an ability to create positive perception, be visible, and exert influence, you can become a high-impact leader who moves the organization forward. Employees who fully utilize the PVI Model become more valuable to an organization. Their productivity and contributions enhance the organization’s performance. Use the power of perception. Why is perception important? How do others perceive you and your team? How can you change that perception, if necessary? You will learn the four-step perception management process. Be visible and raise your profile. You’ll learn how to increase your visibility by standing out and getting noticed. How does someone go from barely being noticed inside an organization to actually being valued and having impact? You will learn the seven ways to gain visibility and raise your profile. Lead through influence. What is influence? How does your influence ability benefit you and your employees? What is the current influence ability of you and your team? You will learn the five traits all influential people have. Please contact us to arrange for this course to be trained at your organization or to have us deliver a keynote presentation on the topic at your event.